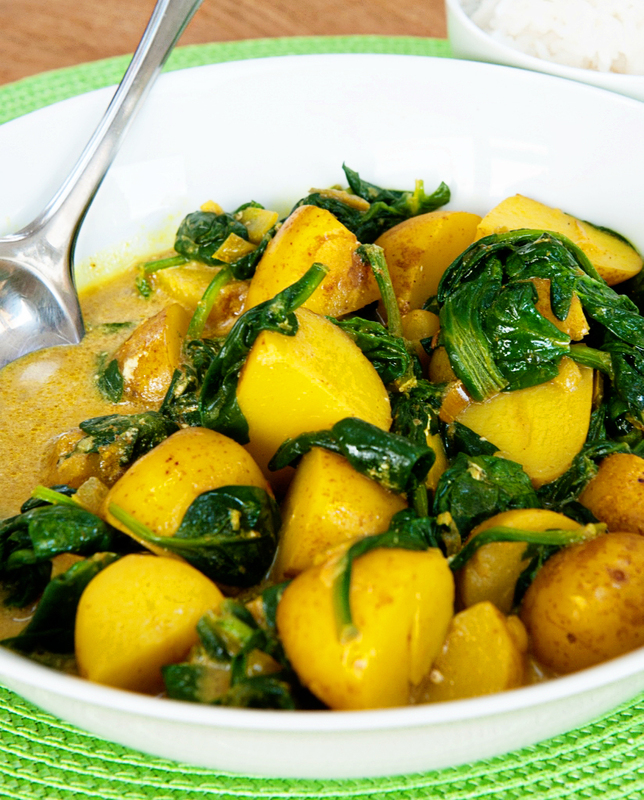 This hearty, healthy curry is best served with a side of our simple dahl. Easy to make and perfect for putting together ahead of time. Leave out the yogurt and add it just before serving. Wash the spinach and remove any tough stalks. Scrub the potatoes and cut into quarters. Peel, halve and finely slice the onion. Peel and crush the garlic. Peel and grate the ginger. Wash, deseed and finely chop the chilli. Roughly chop the pistachios or cashews and set aside. Warm the oil in large saucepan, add the onion and cook until golden. Meanwhile, dissolve the turmeric, ground coriander and cumin in a little water. Add the crushed garlic and grated ginger and work to a paste. Add the spice paste to the onion and cook for a couple of minutes, stirring frequently to prevent the paste sticking to the pan. Add the potatoes and cook for 5 minutes, making sure the potatoes are well coated with the spice mixture. Pour in 500ml of water, cover the pan with a lid and bring the liquid to a simmer. Cook for 20 minutes or until the potatoes are just tender. Add the spinach and cook until just wilted. Stir in the garam masala, a little sea salt and a grinding of black pepper. In a bowl whisk together the yogurt and tomato puree. Remove the curry from the heat and stir in the yogurt mixture. Return the curry to the heat and warm through very gently to prevent the yogurt splitting. Wash and chop the coriander and scatter it over the curry with the nuts to serve.